Ohio State quarterback Dwayne Haskins will work out for the Raiders and Dolphins in the coming days, and also plans to meet with the Redskins, Broncos, and Giants, according to Adam Schefter of ESPN.com (Twitter link). Fully expected to become a top-10 pick in next month’s draft, Haskins will likely embark on a busy schedule over the next several weeks. Haskins performed at OSU’s Pro Day earlier today, giving NFL clubs an up-close look at his abilities, and he’ll surely meet with a number of other teams — in addition to those listed above — in the weeks leading up to the draft. 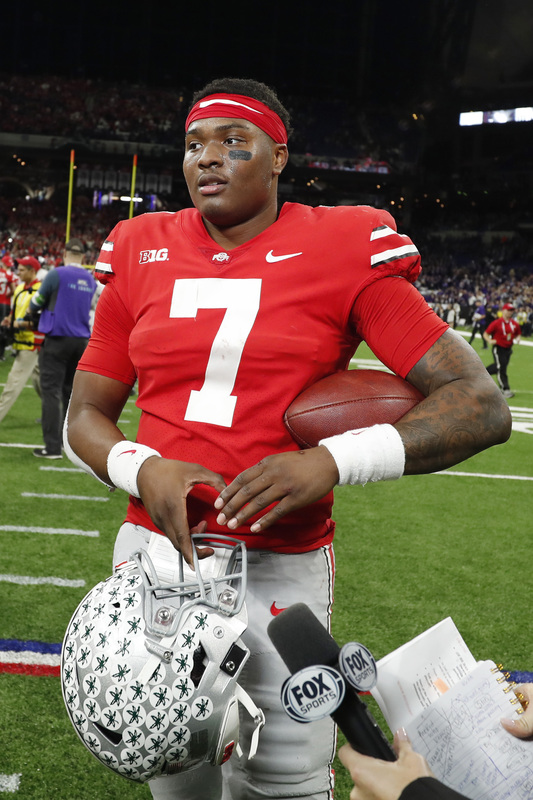 New York will meet with Haskins despite conflicting reports about its potential interest in the Buckeye signal-caller. While some reports have indicated Giants general manager Dave Gettleman is “all over” Haskins, others have said Haskins isn’t likely to be a target for Big Blue. Washington is another logical candidate to land Haskins, as the Redskins need a cheap quarterback given that Alex Smith is expensive and unlikely to play any time soon. Given that need, Washington has already begun “sniffing around” about a possible trade up from No. 15 overall, reports Jason La Canfora of CBSSports.com. The Jets, who are looking to recoup draft capital after moving up for Sam Darnold in 2018, might be a trade partner for Washington at No. 3. Agree 100% about the smoke screen. And yes, Williams would be great too, but just less of a need. PJ and Maurice got really good in the second half of the season, Hankins got resigned, and our new “15 yard personal foul waiting to happen” LB Burfict all clogging up the run lanes, I’m hopeful an edge guy falls on our lap. At least one of those three (Williams, Bosa, & Allen) has to fall to 4. ARI is rumored to get a QB, 49ers, id they dont trade down take one of the three, and the Jets might trade down they might not but they probably should. Thats 3 coinflips for whether or not the those 3 guys are gonna be taken and odds are at least one is gonna slip to 4. The 49ers secondary struggled quite a bit last year, and a major reason for that was their lack of anything resembling a pass rush. In free agency, they’ve tried to cover up some of their other holes by suring up their tackling and underneath coverage by signing an excellent compliment to Warner in Alexander. They’ve also taken a low-risk, low-cost high reward gamble to help their secondary depth by signing Verrett. If healthy, JV should be able to provide their CB depth with a huge boost and some stability. That’s where the Boss comes in. Starting Ford, Armstead, Buckner, and Bosa significantly improves their pass rush immediately, and adding Bosa significantly improves their overall depth and flexibility as well. They’ll be able to sub in Blair, Jones, and Thomas to give the starters some rest, or mix and match based off match ups and down and distance situations. Even with the additions of Alexander, JV, Ford, Bosa, and another secondary prospect in the 2nd/3rd round, the 49ers still won’t have enough depth and the necessary pieces just yet to be a top-tier NFC defense, but they’ll certainly have the potential to get better as the year goes on, and they will unquestionably be able to stop teams frequently enough to give Shannahan, Jimmy G., and their offense a chance to win.. The NFC West is going to be a sneaky solid division come 2019, and when it is all said and done the 49ers very well might have done enough to push themselves right in the thick of it..
lol I would be heart broken. Carr needs another opportunity with a second year in Gruden’s offense and two new WRs. A little protection and he could be back to 2015 Carr that Raider nation fell in love with. Your Giants need to some how get Rosen from the Cardinals without having to give up that #6 pick. Gah! Re-reading your post, it just dawned on me you may be a Raider fan who just doesn’t like Carr! Say it ain’t so! Carr is really not that bad. Best Raiders QB in years and they want to get rid of him. Greedy Raiders’ fans need a reminder just how hard it truly is to get a franchise QB!! Carr is the best option available for them right now..A poor O-Line, and a lack of weapons will make any good QB look incredibly average or below average. Give the man some respect, a compotent line, some weapons, and some time. Then, Carr will re-emerge with the numbers and promise he showed previously. Again, the greedy Raiders fans that are clammoring for a change, need a quick refresher how long it has been since Oakland has even had a MEDIOCRE QB, much less a young and talented franchise QB like Carr.. When was the last time Oakland even had a decent QB?? Pretty sure it was not Carson Palmer’s worst season of his career, putting up a QBR of 46.6 or do you needy fans need to be reminded of names like Jamarcus Russell, Charlie Frye, Kyle Boller, Bruce Gradkowski, Jason Cambell, Matt McGloin, Terrelle Pryor, Andrew Walter, Connor Cook, EJ Manuel, ohh and who can forget Daunte Culpepper’s return…You have to go back to ’99-’02 and Rich Gannon to find their last franchise QB…Just think about that, it’s been almost TWENTY YEARS!! Better be appreciative of what you all have in Carr; otherwise, it could be another 20 years before you find another young, franchise QB! !